In my dining room I have the cutest white rooster hook rack. I can’t remember where I bought it but I just love it. On the hooks I have several of my favorite vintage potholders. 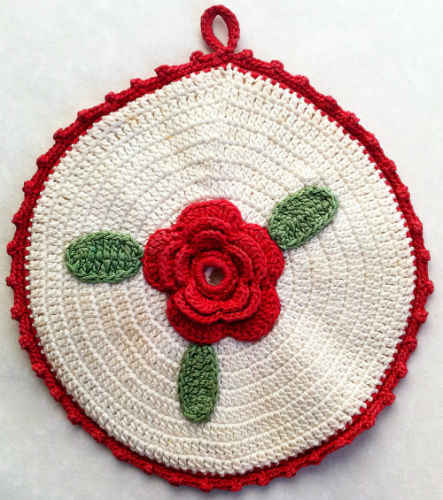 The Round Rose Potholder is a vintage design that I found at an antique show. 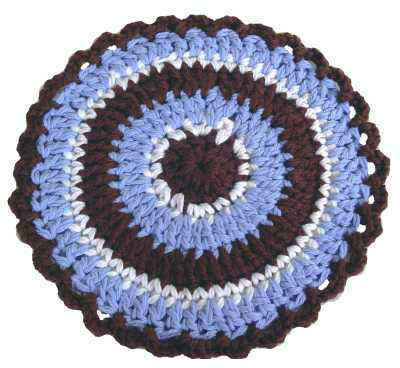 Try this in a variety of crochet cotton thread colors to brighten up your kitchen décor. 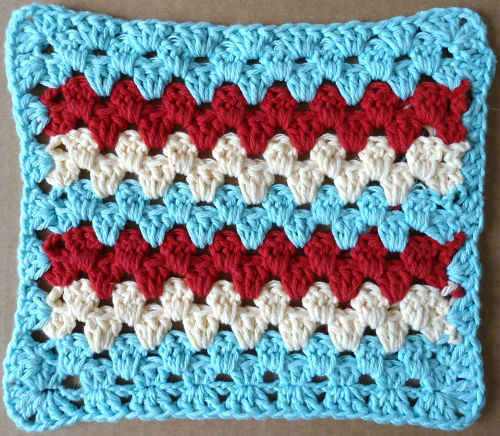 Note: This vintage potholder is for decorative use only. If you pad between the back and front with Mylar lined fabric you could use this potholder and not get burned. Crochet Hook: Size 7 (1.65 mm). Rnd 10: Ch 3, dc in next 23 dc, 2 dc in next dc, (dc in next 24 dc, 2 dc in next dc) around; join. (130 dc) Finish off and weave in ends. Rnd 5: Ch1, (sc, hdc, 6 dc, hdc, sc) in each lp around, join. Rnd 7: Ch 1, (sc, hdc, 8 dc, hdc, sc) in each lp around; join. Finish off and weave in ends. Rnd 1: (Right Side) Starting at center, with Green, ch 9, sc in 2nd ch from hook, hdc in next ch, dc in next 5 ch, 4 dc in last ch, dc in next 5 ch, hdc in next ch, sc in last ch; join with sl st to first sc. Finish off and weave in ends. – Using one Side, with right side facing, position center of Flower to center of Side and sew in place. – Position and sew Leaves around Flower. Rnd 2: Ch 12, sl st in same st as joining, 24 sc in ch-12 lp (Hanger), sc in next sc, * sc in next 2 sc, (sc ch 2, sc) in next sc; rep from * 42 times, sc in next 3 sc; join. Finish off and weave in ends.